When a home has a small space, it becomes very challenging to design especially if the homeowner wants to add a lot of stuff in the home. Also, there might be certain requirements that the homeowner wants to see in their home but is hard to accommodate because of the limited space. Yes, it may be hard to design a home with a small space especially for apartments but many designers are getting more and more creative that they figure out ways to make things work no matter what is the size of the area. But what we are going to feature today doesn’t deal with small spaces. 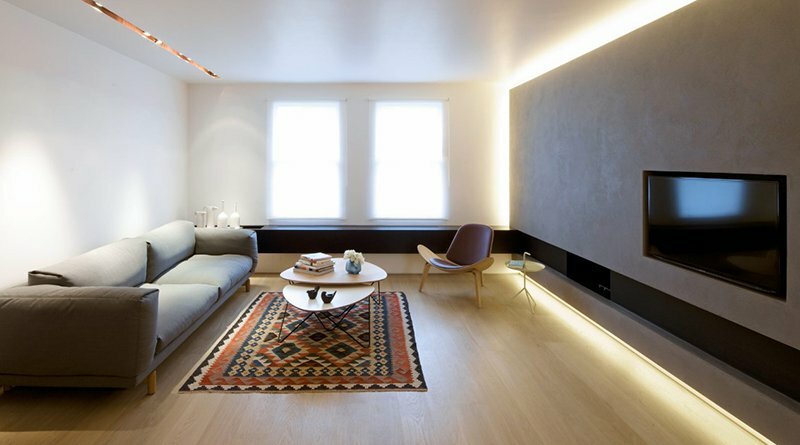 Instead, it shows how an apartment could look really beautiful and unique with a simple touch. Whatever that “simple touch” is, you will find out in the images below. 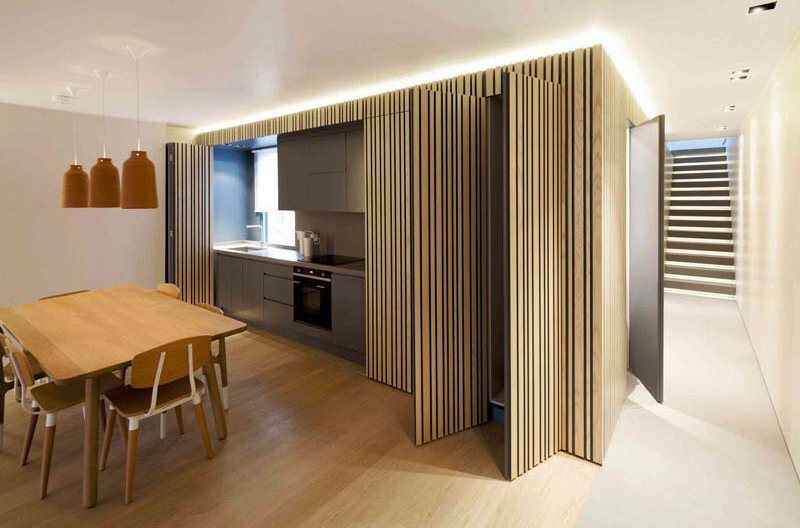 A beautiful apartment in Maida Vale, London was fully renovated and reworked. 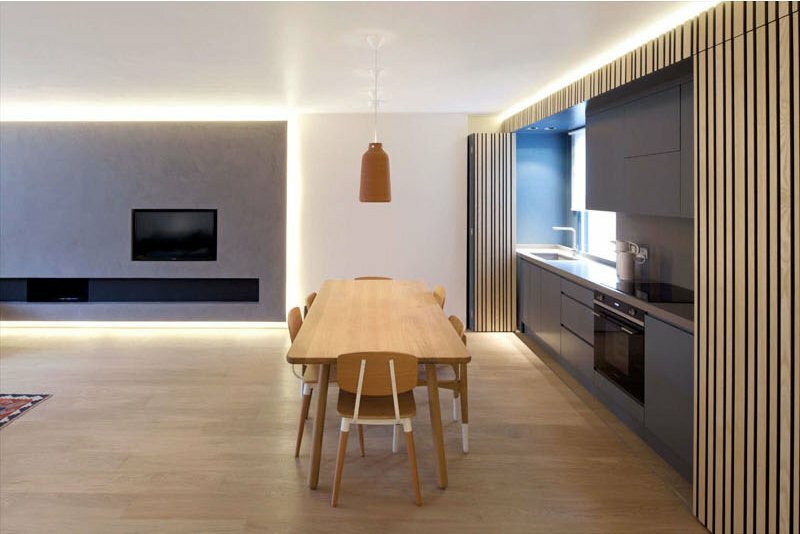 The result is a stunning modern space that serves to the needs of the family who lives in it. The usable area of the space was increased and it was transformed into a unique family home with a modern contemporary feel. What made it even more unique is the box where a kitchen is hidden. Aside from that, the design of the entire space is very nice too. Everything is arranged well while considering good access to different areas of the home. Unique feature: A stunning apartment space which features a huge box that keeps the kitchen hidden from sight. This living room of the apartment which has two windows that bring in the warm sunlight. Notice also that it has a simple design which is still striking and beautiful. Although it used simple furniture designs, the area rug added a statement to the space. The box, where the kitchen is hidden, also closes off the private zone of the flat incorporating two guest bedrooms. Apart from that, a shared bathroom comfortably sits behind the kitchen on the rear facade of the building. 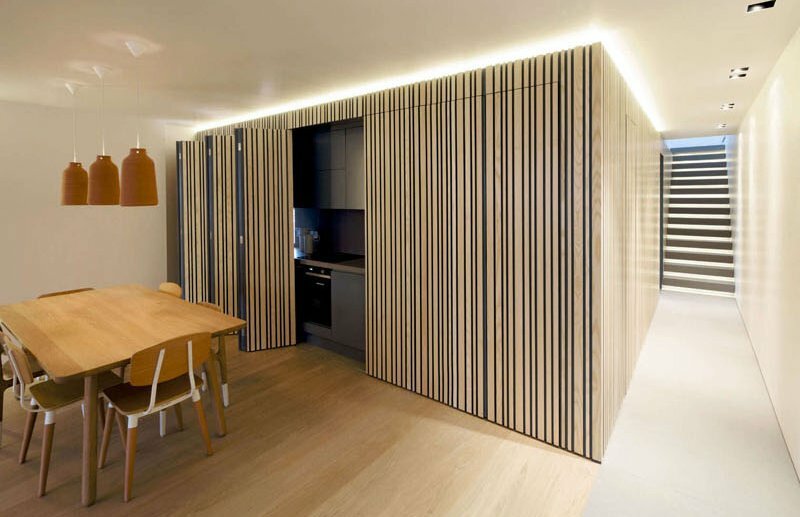 The larch box opens to the living area creating a sociable atmosphere but when closed cleverly tidies away kitchen activity, instantly removing it from the space. On the main floor, the staircase has been shifted back to open up the living area. Meanwhile, the kitchen has been brought forwards and enclosed within a sleek, larch clad box. Combining the kitchen with the dining area has increased the overall area of the living space. It also allows natural light from the front windows to flood through it. One thing I noticed when the kitchen is open is the natural light that floods in the dining space just beside it. Isn’t this a lovely sight to see? Aside from the kitchen, you can see here the wall in the living room with a backlighting just some features in other parts of the home. The staircase, as well as the sink and the dressing area, are lit by ‘task-skylights.’ These have been placed specifically where natural light is helpful. 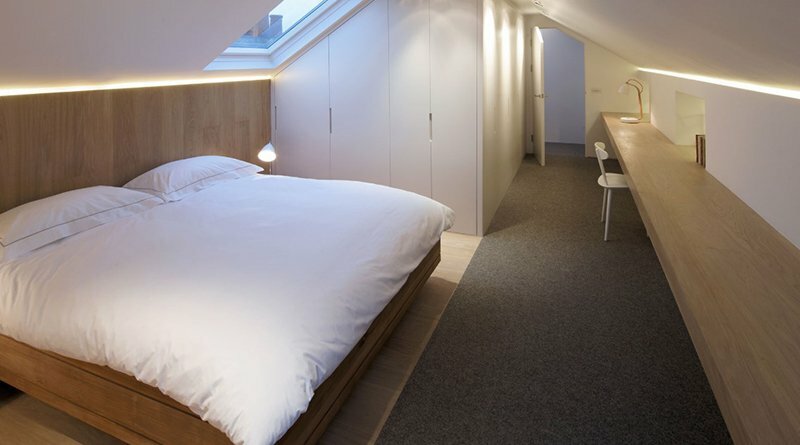 in the upper area of the apartment is a previously unused attic space which has been converted into a peaceful master bedroom suite with open-plan sleeping, study and dressing space and a closed off toilet and shower room. Isn’t this an impressive space? 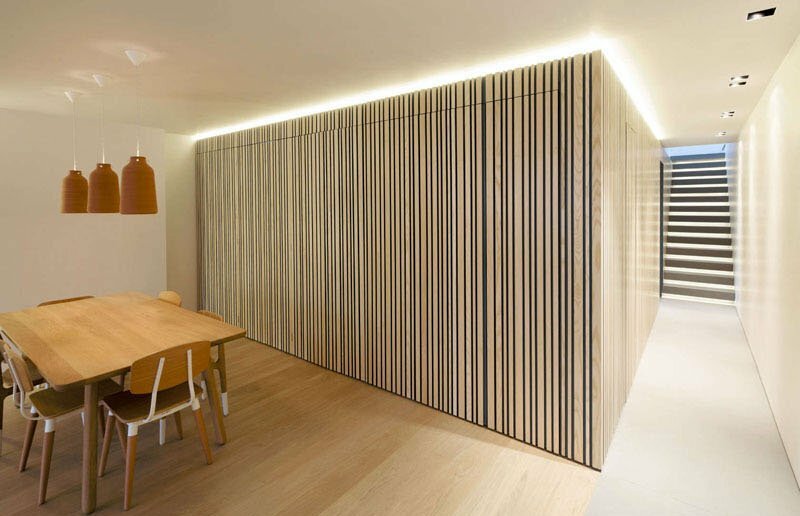 This is a design by K Studio who managed to make the space look not only visually appealing but truly functional as well. For sure you loved the hidden kitchen because it is so neat and no one would suspect that there is indeed a kitchen inside it. 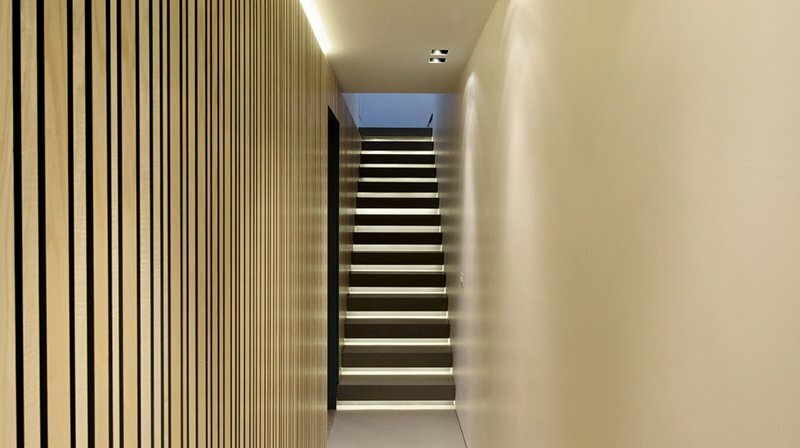 Apart from the thrill factor, it also brought a unique appeal to the space, especially with its larch finish. How about you, what can you say about this apartment? Would you add a hidden kitchen in your home, too?